How many shrooms' can you count on this trippy tapestry? 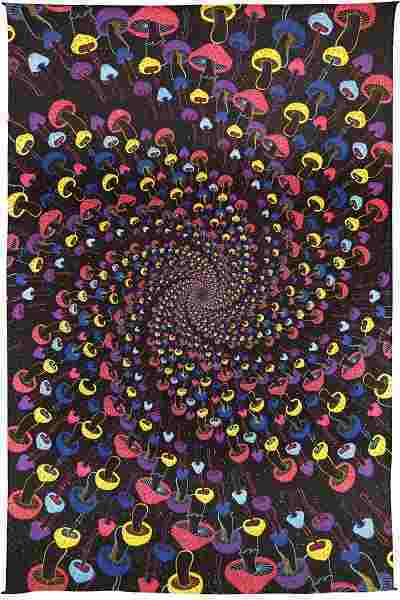 This new spiral magic mushroom tapestry looks great. Super vibrant colors! 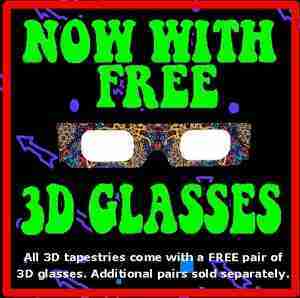 Put on a pair of 3D glasses (we include a pair for free), and hang on tight, because it will blow your mind! This large tapestry is approx. 60" x 90". You can use this tapestry as wall hanging in your home or office, throw it over a couch, or as a bedspread on a twin bed. It would also look great in a dorm room. It is equipped with specially-designed loops to accommodate easy support from a wall, window frame, or ceiling. Just so there’s no confusion, our tapestries are printed not quilted or woven; they’re designed as wall hangings and not as fitted sheets, so they designed to hang them from walls rather than elastic bands to fix them to sheets. That said, they still look cool as Indian-style bed spreads.